I thought I’d like to review a couple of mass produced puukkos for our readers willing to try the style before making the step towards a proper custom hand forged one. 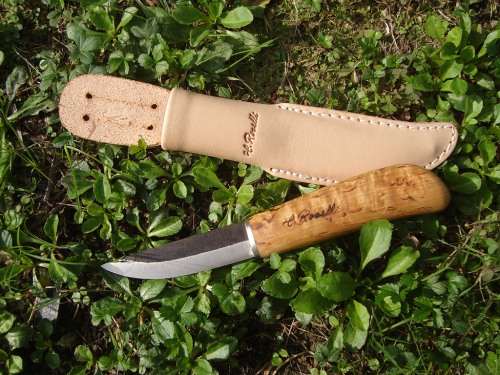 In my opinion Roselli and YP-Taonta knives are the best suited for this, since basically all the other mass produced puukkos uses stamped blades made by Lauri Metallin Oy, therefore without putting any effort in the blade. Also both Roselli, but especially YP-Taonta products see some real forging. H. Roselli Oy is located 1 km out of Harmoinen, at the end of a small road named after the founder, 175 km N of Helsinki.Today it’s famous for the production of mass produced tools involving some forging, for the use of the self developped UHC steel and for the particular character of the owner. This last factor made it difficult to obtain information. Self taught, Roselli started working in ’74 and began forging knives in ’76. In the mid 80s he developed the UHC and in the 90s he began to revive the Finnish smithing tradition, then started mass production. Unlike what he used to claim, bladesmithing never completely died in Finland. Between the 70s and the 90s, in the Kauhava area, was working a triptych of old masters: Altti Kankaanpää, Kustaa Lammi and Yrjö Puronvarsi, near Rovaniemi there was already Veikko Hakkarainen, Roselli himself was working together with what is now considered the Finnish damascus master, Juhani Ahonen. In the early 90s few others by the name of Jukka Hankala, Martti Malinen and Kay Vikström started to forge as well. The Carpenter has gone through many modifications from the 80s onward. Its design derives from the “bird’s head” puukkos born in Kauhava in the 30s, which sported a strongly hooked pommel. On the Carpenter the pommel curve has been softened over the years, the blade started to be stamped instead of forged, the tang became hidden instead of riveted, the bevels shifted from full height convex to the current flat ones, the back stitched sheath was replaced by the current one. The blade was stamped from a bar of Krupp W75, similar to 1080. Roselli claims to personally forge the bevels, heat treating and finishing each blade, but without any further explenation. The blade has a flat section without any tapering whatsoever. The bevels are flat and taken to zero; out of the box it was sharp, but not razor sharp. The birch handle is roughed out by machine then finished by hand. There is a good junction between the blade and the nickel silver bolster. 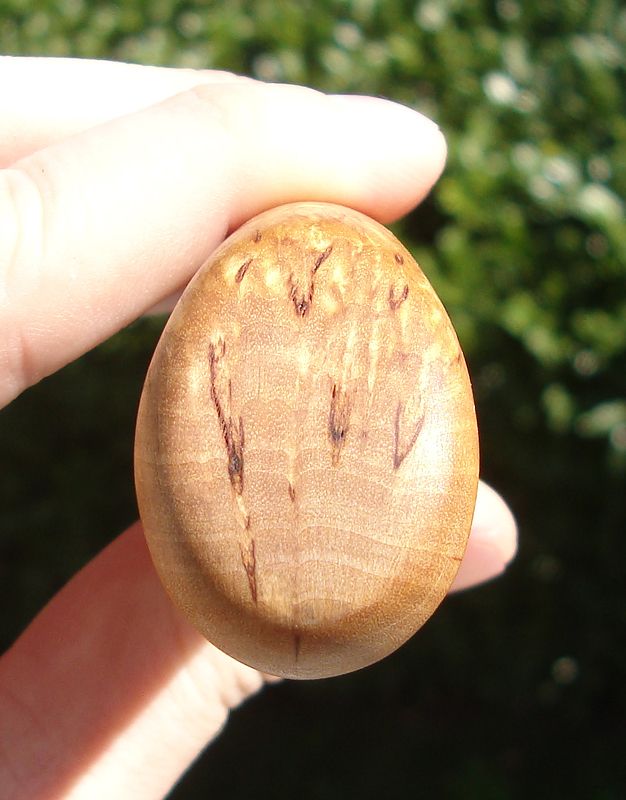 The handle is sanded to a medium grit, has a soft finish and fills the hand well, while still being on the slim side. It tapers towards the blade and has a reversed teardrop section. The sheath, a simplified version of the traditional ones, is made out of 2 mm thick leather and machine stitched. The leather of the mouth is folded to assure good retention; inside there is a protective plastic liner. The slotted belt loop is the simpliest to make and doesn’t have major drawbacks. As said sharpness was good, but not perfect. Around 1.5 cm from the tip I could see and feel two tiny nicks, easily stropped away. Here I report the carving of white spruce butter paddle. During the roughing I felt a good bite and no relevant edge loss. 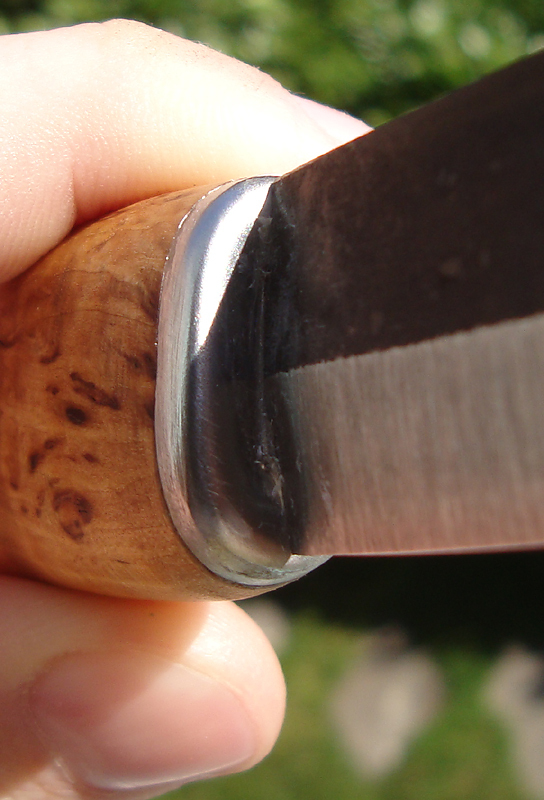 During the further carving I’ve found the puukko slightly slow when working the concave belly and the convex pommel; also it seemed to me it suffered slightly during the refining cuts done pulling to knife towards me. 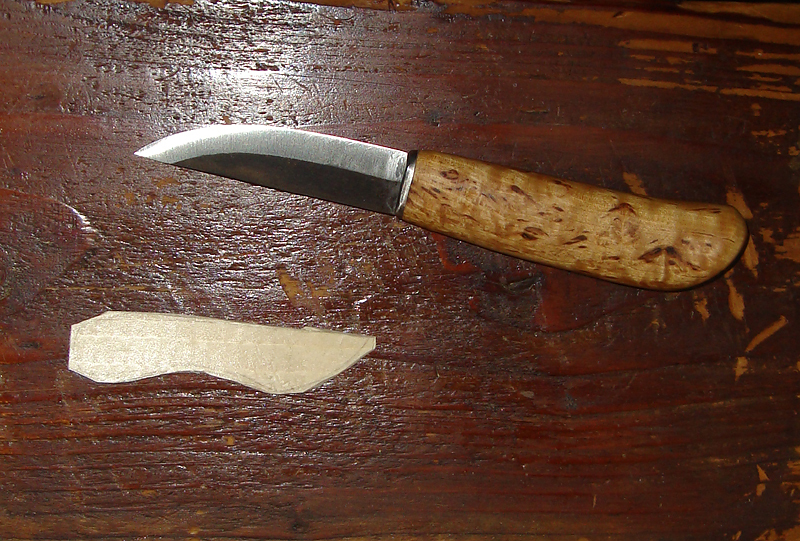 After the sanding I engraved a teiwaz and the puukko worked finely, even though the tip may be a hair too thick. At the end of all the very first cms of blade near the bolster weren’t shaving anymore and, in the belly, I felt with the nail two new small nicks, undetectable by eye anyway. So, edge holding and strength were nothing special, but acceptable. To sum it all up we have a very good handle, comfortable and agile, probably the best among mass produced, flat section, puukkos I’ve tried so far and a blade suffering a bit from the lack of any taper. This would have made all the works done with the tip and the last part of the belly easier and faster. It’s generally a good step forward from Lauri blades, but still far from what a rhombic blade can do. By the way, those not used to them won’t be able to really appreciate the difference.